Why Is ChinaSource Attacking Bitter Winter? You are here: Home / Articles / A Poisoned Source: Why Is ChinaSource Attacking Bitter Winter? A Poisoned Source: Why Is ChinaSource Attacking Bitter Winter? Doubts were raised about the authenticity of a document we published and how Bitter Winter operates, but we were not contacted, and our letter to ChinaSource was ignored. 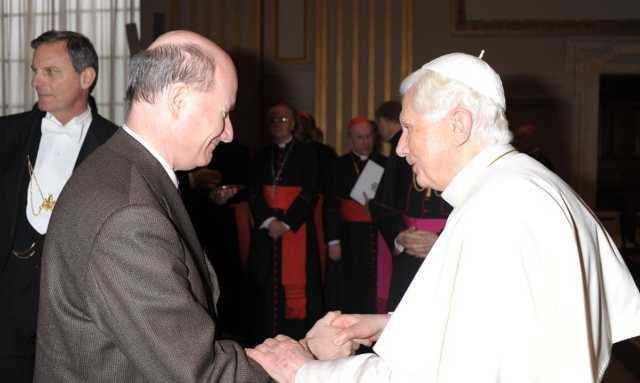 Pope Benedict XVI is congratulating Prof. Introvigne after he lectured at a Vatican-organized conference on the sociological study of the Catholic clergy on November 8, 2012. I read ChinaSource regularly and have often quoted their articles, whose quality I respect. This does not mean I always agree with their approach, though. They seem to try to keep in touch with both the CCP-controlled Three Self Church and the independent house churches. I have met many at conferences internationally and in China who share this approach. They believe dialogue can lead the CCP to soften its stance on independent religion. I am afraid this is as easy as persuading a cannibal to become vegetarian, but I sincerely wish good luck to them. After all, I have also tried, and keep visiting and talking religious liberty in non-democratic countries where some try to persuade me I am wasting my time. On December 28, ChinaSource published an attack against Bitter Winter, occasioned by our publication of an interview with a police officer in Dalian, who reported that police stations in the city are now evaluated also on how many people of faith they detain, and showed our reporter a picture of the related document. They raised doubts on the authenticity of the document, as our picture did not include the official seal, criticized reports in other media who quoted our article and described the policy as national rather than local, and declared Bitter Winter as an unreliable source in general as somewhat sympathetic to the “heretic” Church of Almighty God. I wrote a polite answer to ChinaSource, but they didn’t even acknowledge receipt, never a good sign in my book. As a scholar, I have learned to take all criticism seriously. However, the article by ChinaSource is unnecessarily malevolent and based on misunderstandings that could have been clarified had they contacted Bitter Winter, as many others do. There are three main points of criticism in the article. The first is that “‘China’ is conflated with what was told to them by one policeman, in one city, in one province” and that, although the Bitter Winter story was published in October, other media reported it in December. This is not a criticism of Bitter Winter, though. We have published hundreds of articles and cannot control how other media use them. 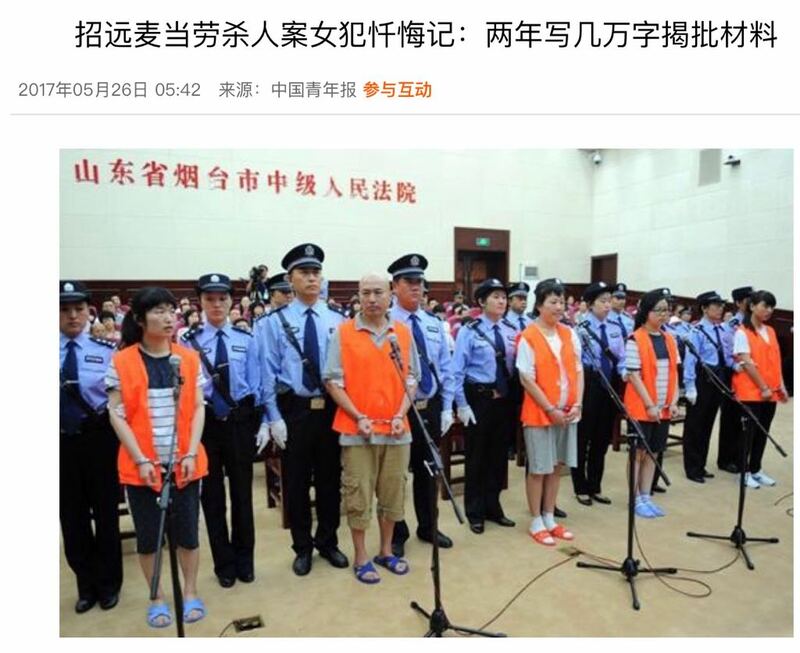 Our article attributed the claim that the plan had been distributed to “all police stations in the city” (of Dalian, which is different from China as a whole) to the “police officer” interviewed. Second, ChinaSource questions the authenticity of the document whose photograph illustrates the article. “Every official government document in China looks the same,” they write, “with the name of the document in red characters at the top, and a red chop (seal) at the bottom with the name of the issuing government office or agency. In China, nothing is official unless it has a red chop!” Accordingly, “that the header and chop are excluded would indicate that they are not on the document. In other words, if they really are on the document, why crop the authenticating features out?”. This may seem impressive to a casual reader, but not to those more conversant with Chinese police practices. First, do we sometimes crop parts of the documents we publish out? The answer is yes. What we crop out includes stamps or other elements that would tell from what local office or police station the document was leaked, making the police’s work of identifying and arresting our reporters and those cooperating with them easier. Sorry, ChinaSource, but since our reporters keep being arrested, we take their security concerns very seriously. Second, the document we reproduced was issued by a District’s National Security Brigade in Dalian city to every police station under that District’s jurisdiction. At least one station sent it to every police officer on their cell phones. Our reporter took a picture of the screen of the interviewed officer’s cell phone. Third, not all the internal CCP documents would bear a seal, because some are internal notices or used for conferences, etc., and these documents do not necessarily have a seal. An “assessment plan” such as the one the police officer described is an example of a document that does not necessarily bear a seal. ChinaSource may claim that without a seal documents are not “official,” but they may be enforced and implemented nonetheless. Fourth, with all due respect, the recipe of “looking for the red chop” is a bit naïve. As a scholar, inter alia, of esotericism, I have written about several forged documents (including those mentioned by Dan Brown in The Da Vinci Code). It is typical of forged documents to have all their seals and stamps in order. They are very easy to imitate, the more so with contemporary electronic techniques. The third criticism by ChinaSource is the most interesting because it answers the question of why they decided to attack us in the first place. The author of the article, Ms. Joann Pittman, writes that, “I have done a fair amount of research on that site [Bitter Winter] and it seems to have connections to, or at least sympathies with the Eastern Lightning/Almighty God cult in China. As a result, I tend to approach their stories with a healthy dose of caution.” From the point of view of a scholar of new religious movements, this is a fantastic statement. It reveals two things. First, there is here a liberal dose of the usual anti-cult prejudice according to which a journalist who (allegedly) sympathizes for a “cult” should be less reliable than, say, one who attends on Sunday the local Baptist or Methodist Church. Second, Ms. Pittman may have done “a fair amount of research” on Bitter Winter but she missed the essential that Bitter Winter is operated by CESNUR, the Center for Studies on New Religions, the oldest (it was founded in 1988) and largest international network of scholars specialized in new religious movements, and edited by the undersigned as editor-in-chief. A quick look at the Web, or even Wikipedia, would have told her that both director-in-charge Marco Respinti and I are active Roman Catholics with a long career in Catholic universities, media, and institution. It would also have told her that I am fairly well-known as a scholar of new religious movements and that, as happened to other distinguished academics in the same field, I have been accused of being “connected” or a “cult apologist” for a good dozen of movements I have written or edited textbooks about, including the Mormons, the Jehovah’s Witnesses, the Unification Church, Scientology, the Plymouth Brethren, and even Satanism (on the latter two groups I have written the standard English-language textbooks, published respectively by Oxford University Press and Brill). My next book to be published will indeed be on The Church of Almighty God, based on hundreds of interviews with members of that Church as well as with police officers engaged in suppressing it in China, who also introduced me to “re-educated” ex-members. As a publication operated by CESNUR and edited by me, Bitter Winter obviously pays special attention to new religious movements in China (this was indeed part of our original statement of purpose) and, as mentioned earlier, we do not believe that members of these movements are second-class believers or their human rights are less important than those of Buddhists or Catholics. We also devote equal attention to Christians and non-Christians, including the Uyghurs. I always found quite funny the accusations of being a “member” or “connected to” each religious movement I wrote a book or a series of articles about (and I wrote seventy books and several hundred articles). More seriously, this betrays a fundamental non-comprehension of the approach of sociologists of religion, which is by definition value-free, non-theological, non-judgmental, and tries as much as possible to understand the point of view of the studied movement. In this sense, being accused of being a “member” of each group I wrote about is simply an acknowledgment that I have applied the sociological method correctly. Ms. Pittman’s argument was echoed by a theologian going under the pseudonym of Jackson Wu (吴荣) in Patheos. It is an interesting article, and at one stage it notes that “Bitter Winter is more sympathetic to Eastern Lightning (EL) [another name used for The Church of Almighty God] than other organizations. When I say ‘sympathetic,’ I don’t imply they endorse EL’s theology, but rather they want the government not to treat EL abusively, etc.” Perhaps Professor Wu did not re-read this particular sentence before posting the article. I am sure we all agree that we do not want the Chinese government to treat any religious group or citizen “abusively,” and that Wu’s article was not intended as an apology for abuse. We are also accused of “confusing official mandates about dealing with EL versus how police are to respond to Christian churches. Even if not, presenting the police’s response to EL should not be confused with the government’s persecution of the church.” But this is precisely a confusion we do not entertain. I and others associated with Bitter Winter have spent considerable time, both in our academic and popular writings, to explain, to those who do not know it, the different legal treatment in China of groups included in the list of the xie jiao, including The Church of Almighty God, and of house churches not included in the xie jiao list. We return to this distinction time and again, and we agree with Professor Wu it is a capital one. However, we may draw different conclusions from it. Not being interested in defending one theology or religion against another, we regard the fact that the groups listed as xie jiao are under more severe persecution, grounded in a different legal situation, as an argument for regarding them as a more pressing humanitarian emergency, particularly when dealing with asylum requests abroad. Ms. Pittman and perhaps Professor Wu may still object that they do not like “cults” or xie jiao because they commit crimes. We all know this is not entirely true. Christians like Ms. Pittman do not like “cults” because they come and convert members out of their churches. I always wonder why it is so difficult for some Christians to accept that international conventions include as part of religious liberty the freedom of proselytization, and that Christians have themselves practiced “sheep-stealing” against other religions for centuries. As for the crimes, lest I am mistaken for the stereotypical naïve scholar of new religious movements regarding all forms of religion as benign, I have proposed myself the category of “criminal religious movements,” which I tried to explain to the Chinese authorities in a lecture during a seminar co-organized in Hong Kong by the China Anti-Xie-jiao association and attended by senior Office 610 officers, which later evolved into an article. Whether a group is a “criminal religious movement” is a question of fact. In articles written both by myself and together with other distinguished scholars of religion, I have debunked accusations against The Church of Almighty God, particularly about the murder in a McDonald’s in Zhaoyuan in 2014, as fake news spread by the Chinese propaganda—and this on the basis of documents supplied to me or published by the Chinese authorities themselves. I do not believe The Church of Almighty God kidnapped Christian pastors and lay workers either, and I have explained why. ChinaSource may rest assured that Bitter Winter will continue to defend the religious liberty and human rights of all believers (and unbelievers) in China, irrespective of their theology, and to expose those who willingly cooperate with the persecution, torture, and fake news campaigns of the CCP as its minions. I am confident those who really believe in religious liberty will salute this as a worthy enterprise. Update (January 3, 2018): The author has now received a response to his private mail from Ms. Pittman, where she indicates that she meant no disrespect for our work. In turn, while a public criticism made a public response to the important issues raised by Ms. Pittman necessary, we are happy to continue a dialogue with ChinaSource, realize that they also operate in difficult conditions, and respect the quality of their texts.